Three B-2 Spirit stealth bombers are headed to the Pacific theater, the Air Force announced Tuesday. The bombers flew from Whiteman Air Force Base, Missouri, to Andersen Air Force Base in Guam, the service said. "Bomber aircraft provide the [U.S. Pacific Command] area of responsibility with an effective deterrent capability, ensuring the regional security and stability of the U.S. and our allies and partners," Gen. Terrence O’Shaughnessy, the commander of Pacific Air Forces, said in a press release. "These bomber deployments visibly demonstrate our readiness and commitment to the Indo-Asia-Pacific region." Adm. Cecil Haney, the head of U.S. Strategic Command, said that "bomber training missions ensure crews maintain a high state of readiness and proficiency and demonstrate our ability to provide an always-ready global strike capability, whenever and wherever we are called to do so." Three B-2s also deployed to the region in March, their first deployment to the region since and again in August 2014. In March 2013, a B-2 flew all the way from the U.S. to South Korea and dropped an inert munition during a training exercise. The move was widely viewed as a demonstration to North Korea of U.S. bomber capability, following increased tensions on the Korean Peninsula. 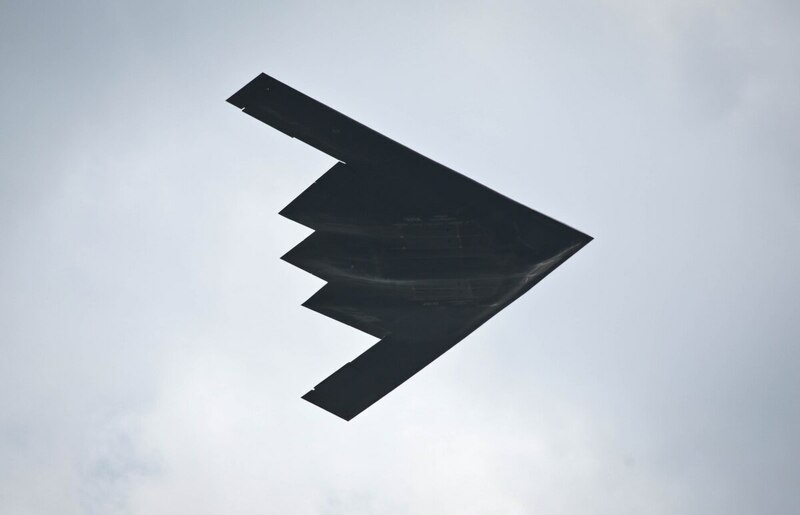 In late July, the B-2 stealth bombers participated in a global exercise named "Polar Roar," which included flights to the Arctic, Alaska, and the Baltic Sea. Other bombers have also deployed to the Pacific, including the B-52 Stratofortress which has seen a number of rotations in the AOR. The Spirits will be in Guam at the same time as B-1 bombers from Ellsworth Air Force Base, South Dakota. An undisclosed number of Lancers and approximately 300 airmen deployed Aug. 6 as part of the military's continuous bomber presence mission in the Pacific. B-1s were last in the region in April 2006.